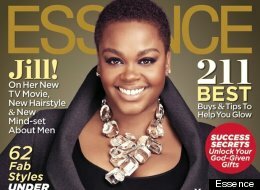 Jill Scott, singer-songwriter, poet and actress, is on the October cover of Essence magazine. Following in the footsteps of other celebrities recently, she is a rocking her natural nail and it looks smashing. Jill Scott is sporting a short afro on the cover. Despite reports to the contrary Jill and Essence collaborated on the cover photograph. Instead of donning a wig or extensions, they decided to show her natural hair. Jill was excited that Essence offered her to chance to present a totally different look. Jill is known for her ever changing musical styles, so to showcase her natural hair seemed the thing to do. If you take a look at the cover you will see Essence and Jill knew what they were doing. She looks absolutely fabulous. So maybe now we can get back to listening to her cool jams. After all, her fans already knew Jill Scott sounds and looks beautiful.